Comptoir+Cuisine – Concept store and bistro bringing all that is good and delicious about French food and products under one roof. Our champagne bar is open! Four friends, Maud, Stefano, Yann, Frank; French and Italian expats, all united by their love for champagne, and cheese, and all convinced that the two are the perfect match! Since opening their Champagne+Fromage bistros in London in 2011, they have been on a mission to prove the flavours, the utility and the versatility of Grower Champagne, and cheese, and that they can be enjoyed and savoured throughout the year, and in fact (almost!) around the clock! Now, as well as introducing as many people as possible to the delights of Grower Champagne – varieties by independent producers who are passionate in following the traditional methods of artisanal wine making, they are keen to take things further by offering you the chance to experience some of the best food, drink, produce and products that France has to offer. Perfect place to indulge & inspire you! Everything you see in the shop will be available to purchase: homeware, cookware, utensils, skincare, fabrics, furnishings and even furniture can be yours to take home or gift to friends and family. Perhaps you think that the table you are sat at for morning coffee will look right at home in your conservatory, or the shelf unit displaying French condiments will give your kitchen a stamp of individuality and je ne sais quoi? Feel like you could stay seated in your chair all day and wish you could take it with you? Well now you can! The team is constantly on the hunt for suitable pieces to use and display in the market, and to help you bring chic, artisanal style to your home. To ensure that this broad range of food and products will all fit the bill in order to showcase the very best of what France has to offer, everything in Comptoir+Cuisine has to match strict criteria; artisanal production, organic and/or ethical sourcing, outstanding quality, and an uncanny ability to find a special place in your heart and keep you coming back for more! Open for breakfast, lunch, afternoon tea and dinner! At Comptoir+Cuisine we serve coffee, juice, croissants and pastries, making it the perfect spot for breakfast, a mid morning snack, or as a welcome respite from the hustle and bustle – to sit and read, or to catch up with friends or colleagues. For lunch and dinner, alongside nibbles and snacks, we serve cheese and charcuterie boards,(including our hugely popular baked camembert cheeses! 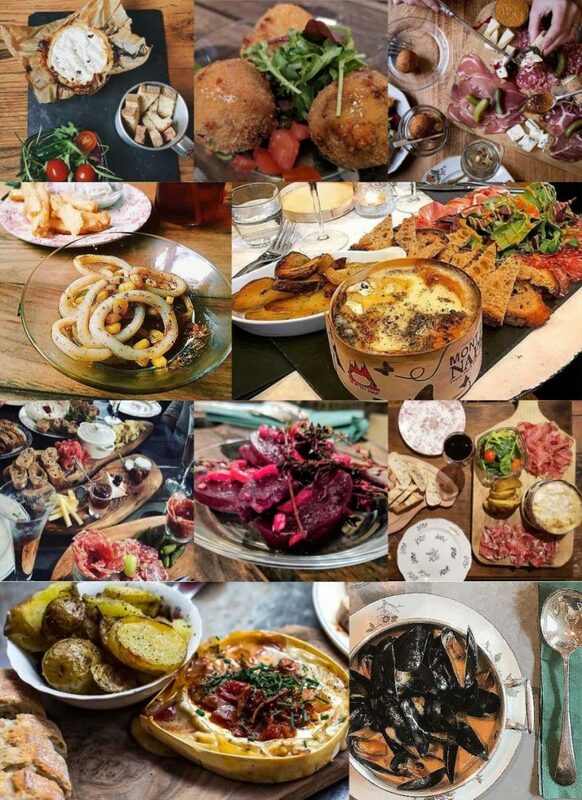 ), salads and we’re pleased to introduce a delicious range of tapas style French sharing plates including meat, fish, cheese and extensive vegetarian options. Comptoir+Cuisine will also offer a selection of Grower Champagnes by the glass, and of course beer and wine too! We know that some of you will probably fancy a sweet treat, we often do too! We have a tasty selection of macaroons and gateaux on offer. Believe it or not, these taste even better when enjoyed with a glass of crisp Grower Champagne for afternoon tea! Are you seeking new experiences and new flavour combinations? Then come and explore our champagne bar! 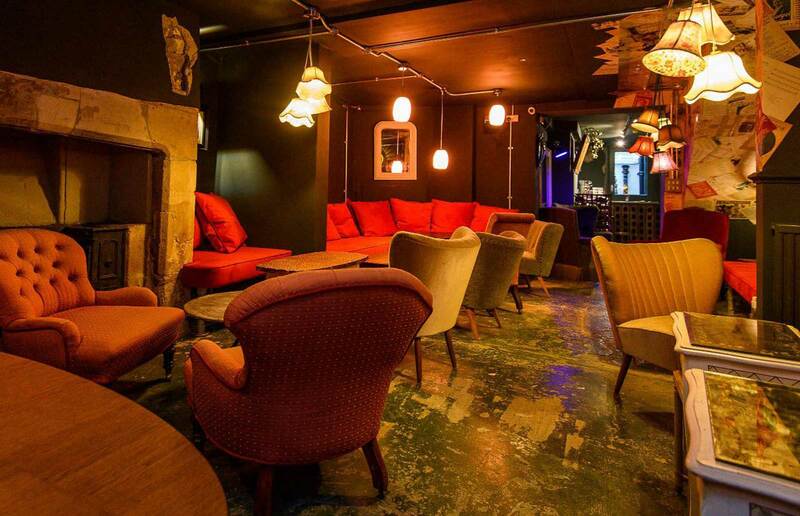 Our snug basement bar offers a warm and cosy, yet sophisticated, setting in which you can kick back, relax, and explore our huge range of artisan Grower Champagne! Similarly to our Champagne+Fromage located in London, we have a choice of over 50 available by the glass or bottle, including some exclusives. Or why not try one of our classic cocktails such as a Negroni or an Aperol Spritz, or our champagne cocktails? Fancy a Bath Sunrise, a French 51 or an Earl Grey Fizz? The choice is yours! If that doesn’t take your fancy then we also have an extensive list of rum, vodka, gin, whisky and brandy. Even better, we offer a great menu of fantastic cheese and charcuterie boards, baked camembert and nibbles to accompany your drinks. Again, our staff will be more than happy to advise you on some fantastic food & drink pairings. What’s more, we’re open until 1am on Friday and Saturday nights, so be sure to secure your spot by booking a table now! We have different options available across the three floors so we are pretty sure we can offer you the configuration you need to help you make your event be the best it can be! From a family meal or celebration , to a party with friends, or a reception, or a product launch, or a meeting with colleagues, please get in touch with us to find out how we can help you. 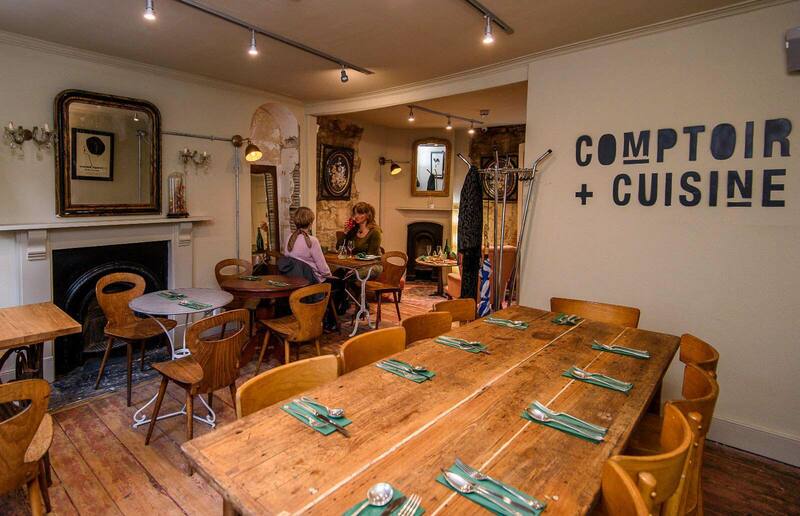 The first floor is a great space for private hire with room for 20 people seated and more (30-40) standing. The new split level basement has capacity to seat 30 people, and can host up to 50 people standing.